Celebrate your wedding in our villas in Tuscany! Choose Borgo del Castellaccio, an ancient hamlet of houses situated in panoramic and quiet location amidst the green hills surrounding Pisa. This enchanting estate in the heart of Tuscany, surrounded by 160 hectares of woods, vineyards and olive-groves, is the perfect location for a wedding or holidays and comprises a small villa, 2 farmhouses and an ancient guard-tower enjoying splendid views over the rural landscape. The 4 buildings have been skilfully restored preserving their original architectural features and turned into 8 charming apartments, all of which offering tastefully furnished interiors. Distances: the small town of Fauglia with all kinds of shops 2 km, Pontedera 18 km, Livorno 19 km, Pisa 20 km. The beaches of Tirrenia are reachable in a 20-minute drive, while the Versilia coastline, one of the most beautiful area of Tuscany, with nice restaurants and fashionable discos is approx. 45 km away. The access to the property is via an unpaved but well-maintained road. Covered parking within the grounds. At guests' disposal: large equipped garden, swimming-pool (16 x 8 m - maximum depth 2,50 m - open from 01/05 to 30/09) and bread-oven. Extra services: maid service available by arrangement (€ 13,- / per hour to be paid on the spot). Possibility of hiring an extra bed (€ 50,- / per week to be paid on the spot) and a baby bed (€ 27,- / per week to be paid on the spot). In the wine cellars of the estate, situated approx. 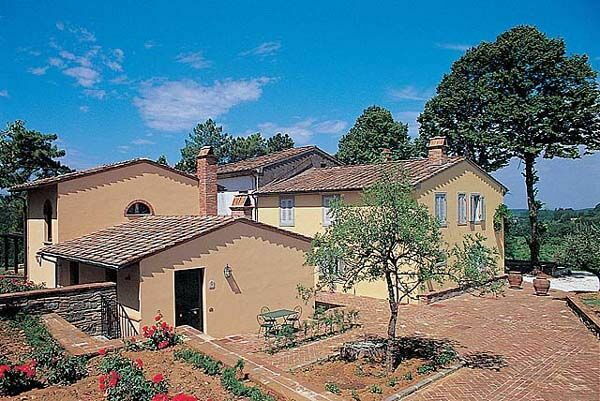 1 km from the apartments, it is possible to taste olive oil, wine, grappa and honey typical of Tuscany. 60 m2. Ground floor: living-room with kitchen corner, dining area and fireplace, open gallery with 2 single beds, double bedroom, bathroom with shower.